The parallel plate flow chamber has become a mainstay for examination of leukocytes under physiologic flow conditions. Several design modifications have occurred over the years, yet a comparison of these different designs has not been performed. In addition, the reagent requirements of many designs prohibit the study of rare leukocyte populations and require large amounts of reagents. In this study, we evaluate modifications to a newer parallel plate flow chamber design in comparison to the original parallel plate flow chamber described by Lawrence et al. We show that modifications in the chamber size, internal tubing diameters, injection valves, and a recirculation design may dramatically reduce the cellular and reagent requirements without altering measurements. These modifications are simple and easily implemented so that study of rare leukocyte subsets using scarce or expensive reagents can occur. Localization of leukocytes to tissue sites is a critical part of infectious, inflammatory or immune responses [1, 2]. Emigration of leukocytes from blood into tissue requires a complex array of molecular and cellular events between the flowing leukocyte and endothelium lining the blood vessel wall. Development of the parallel plate flow chamber that simulates the conditions of physiologic flow has been an important tool for dissecting the molecular events occurring between flowing leukocytes and endothelium [3–13]. One of the first parallel plate flow chamber described to study neutrophil adhesion to endothelium was described in 1987 by Lawrence et al . Initially, several investigators produced chambers identical to or very similar to this design, and over the years this initial design has been the most widely used . This design allowed for study of leukocyte-endothelial interaction from a top-down view and under laminar flow that occurs in the post-capillary venules, the physiologically relevant site for most leukocyte emigration. Design modifications have also been made that allow for pulsatile flow, a simulation of larger vessel blood flow, as well as lateral viewing that can give more detailed morphologic information [11, 12]. Agarose-cast vessels and glass capillary flow chambers have also been described [12, 14, 15]. In spite of the large number of scientifically important observations that have been made with this technology, these chambers have at least two weaknesses: 1) Significant numbers of leukocytes are required, making study of rare leukocyte populations such as basophils or some lymphocyte subsets difficult, and 2) Large amounts of inhibitors are needed to study their effects, limiting the use of the parallel plate as a tool for drug discovery. More recently, a commercially-produced flow chamber (GlycoTech, Rockville, MD) is available that potentially overcomes these weaknesses, since it is considerably smaller than the initial chamber produced by Lawrence et al . In this study we were interested in comparing the reagent and cellular requirements of the newer GlycoTech chamber with different modifications to the chamber described by Lawrence . In addition, we wished to test modifications in tubing and pumps in order to optimize the architecture of the flow chambers for study of rare leukocyte populations and small molecule antagonists. We empirically determined the volume needs for each chamber design and modification by measuring the volume needed to fill the chamber, tubing, and other components. A comparison of the volume and cellular requirements for each parallel plate flow chamber configuration is summarized in Table 1. We compared the potential capabilities of three chamber designs, the original chamber designed by Lawrence  ("classic" chamber), the single pass GlycoTech design (Product 31–001), and a recirculating design using the GlycoTech chamber (Fig. 1). In order to assess the potential cellular requirements for an experiment, we assumed usage of standard isolation techniques of blood leukocytes with venipucture volumes that we and others employ for these experiments [6, 13, 16, 17], which are 30 ml, 100 ml, and 100 ml for neutrophils, eosinophils, and basophils, respectively. Neutrophils, eosinophils and basophils are at concentration ranges of 1800–7000/μl, 0–300/μl, and 0–100/μl, respectively, in normal adults . Accordingly, the total cells yielded from these preparations are typically 3 × 107, 2 × 106, and 6 × 105 leukocytes per preparation of neutrophils, eosinophils, or basophils, respectively. Furthermore, one of the disadvantages of the GlycoTech chamber is that it does not have injection ports for studying the rapid effects of soluble substances on leukocyte behavior. To circumvent this problem, we added a stopcock valve to allow for reagent injection (Fig. 1C). This design with the stopcock was used in the calculations below. Schematic of parallel plate flow chamber configurations. (A) The parallel plate flow chamber as described by Lawrence et al [Reference 7]. 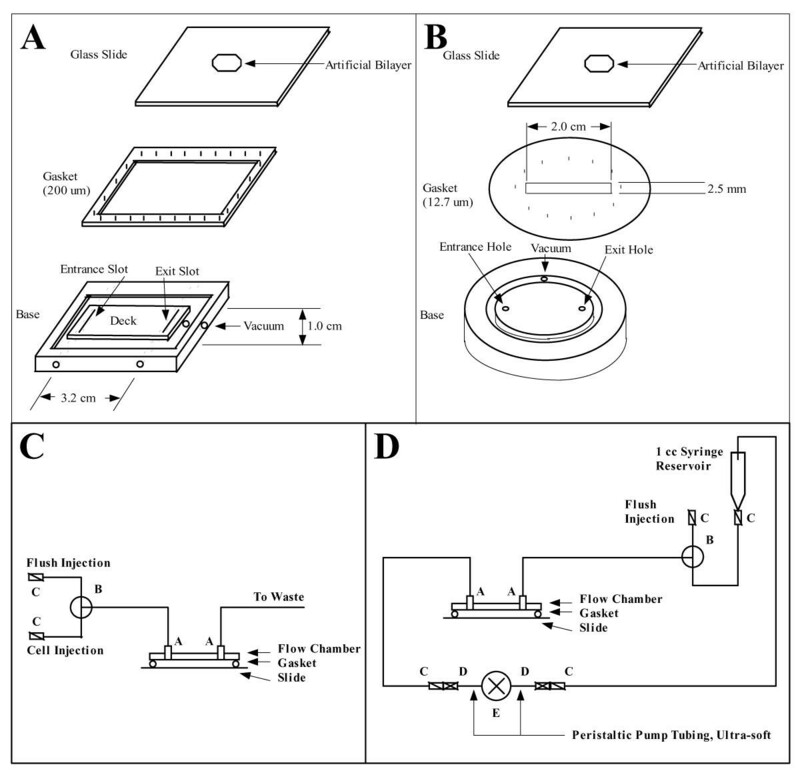 (B) The parallel plate available from Glycotech, (C) Schematic of the single pass chamber with value in place for injection of cells or soluble reagents, (D) Schematic for recirculating system with parallel plate flow chamber. * Number of experimental conditions calculated assuming 0.02" I.D. for the improved chamber and 0.062" I.D. for the classic chamber. I.D., internal diameter; N/A, not applicable, see text for details. Approximate cell number per preparation is 3 × 107 neutrophils, 2 × 106 eosinophils, and 6 × 105 basophils per preparation. Dead volume refers to the entire fluid volume external to the flow path. We next calculated the number of cells that would be required for the two most common usages of a parallel plate flow chamber; 1) a standard shear curve (i.e. number of cells attached to a surface versus a range of shear forces) and 2) a constant shear perfusion experiment in which the number of attached cells is determined over a 10 min period. In order to obtain a significant number of attached cells during the experiment, we assumed that cells would be used at a concentration of 1 × 106/ml as is commonly practiced. Using standard tubing (0.062" I.D, internal diameter) there are significant differences in the volume and cells needed for an experiment using the three chamber configurations. The classic and single pass GlycoTech chamber needed 1 × 107 versus 2.4 × 106 cells to produce a shear curve. One of the weaknesses of the re-circulating parallel plate using a Harvard Apparatus peristaltic pump is that the pump rate cannot be changed without stopping the pump. Thus, the reciculating design in Fig. 1D cannot be used to produce shear curves. Likewise, there are significant differences in the cellular and volume needs for a constant shear experiment between the classic, single pass GlycoTech, and recirculation chambers (1.2 × 107, 2.2 × 106, and 4.1 × 106 cells respectively). Tubing diameter may also dramatically impact the total volume and cells required per experiment. We examined the dead volume and total cellular requirements using the standard 0.062" ID as well as 0.02" ID and 0.01" ID tubing. We did not use ID less than 0.01" ID (254 μm) since neutrophil diameters vary from 7–15 μm, and we wished to have ample diameter for cell passage. Furthermore, post-capillary venules, the physiologically relevant site of leukocyte extravasation, have diameters of 30–80 μm . Finally, technical issues occurred with 0.01" ID (see below). Narrower internal tubing diameters resulted in a 66–83 % reduction in cell or volume requirements. Therefore, an increase in number of experiments could be performed per cell preparation, and the need for reagents whether they be soluble factors, monoclonal antibodies, or small molecule antagonists would also be reduced proportionately with smaller volumes. Reduction in the proportion of dead volume to total volume per experiment also contributes to the reduction in cells and reagents. The dead volume is dramatically reduced with the reduction of the internal diameter of the tubing regardless of chamber design (Table 1). One of the principal reasons of regeant and cell waste is the dead volume, since dead volume constitutes from 6–100% of the total volume per experiment (depending on the chamber configuration, see Table 1). Since the dead volume is reduced in addition to the total volume with either the single pass or recirculating GlycoTech chamber design in comparison to the classic chamber, there is significant reduction in the amount of reagent or cells needed for each experiment. The length of time of an experiment is also important consideration in the comparison of the single pass GlycoTech to recirculating design in terms of reagent use. The GlycoTech chamber requires 66–83% less cells or reagents in comparison to the GlycoTech single pass in a 10 min constant shear experiment. However, if 3 min experiments with 0.062" ID tubing were performed, which have been reported , then the recirculating chamber requires 15% more total volume than the classic chamber and 639% more volume than the single pass GlycoTech chamber. Thus, since the single pass chamber requires increasing reagents with time, the requirements may be smaller with the re-circulating configuration depending on the length of experiment. To verify the performance of the single pass GlycoTech and re-circulating flow chamber, measurements of leukocyte adhesion made with these chambers were compared to those of the classic chamber. Several standard measurements can be made with a parallel plate flow chamber, including the total number of attached cells, the number of rolling cells, the number of firmly arrested cells, and the rolling velocity. We performed experiments that measured each of these quantities and compared the precision of the measurements among each parallel plate flow chamber design. We first examined the number of flowing neutrophils that attached to EC monolayers in both the classic and GlycoTech single pass flow chambers over a range of shear stress. (Fig 2A) The range of shear stress was chosen to recapitulate those in the post-capillary venules (0.5–5 dynes/cm2). No statistically significant differences were seen in terms of the number of cells that attached to activated endothelium over the range of shear stresses examined. Comparison of measurements in the 3 parallel plate flow chamber configurations. (A) Shear curves generated by perfusing neutrophils over activated with LPS (squares) or unactivated (triangles) EC using the classic (closed triangle and square) or single pass (open triangle or square) Glycotech chambers. The experiment was performed as described in the material and methods section. (B) Constant shear experiments comparing the three different chamber configurations as described in material and methods. Neutrophils were perfused over activated endothelium in either the classic (B1), single pass Glycotech (B2), or recirculation chambers (B3). The number of rolling (black bars) and arrested (clear bars) cells were determined each minute. S.D. is indicated by bars. S.D. bars directed up represent S.D. for rolling cells, and S.D. bars directed down represent S.D. for firm cells; n = 3. We next examined whether the number of rolling and firmly adhered cells was quantified similarly. We perfused neutrophils over a monolayer of activated EC at 1.5 dynes/cm2 for 10 mins. Each min we determined the number of rolling and firmly adhered cells in the microscope field using each of the three chambers (Fig. 1B). No statistically significant differences were seen between the classic, single pass GlycoTech or recirculating designs. These experiments were performed with 0.02" ID tubing, since similar experiments with 0.01" ID tubing had bubbles in the line that stripped the neutrophils off the EC surface periodically (data not shown). This occurred even after de-gasing the perfusion buffer overnight. Although not proven, we think this is likely due to small difference between the ID of the tubing and the connecting ports that allows for slow accumulation of bubbles that periodically release, flowing over, and destroying the monolayer. Finally, we calculated the rolling velocity in the different chambers (Table 2). Neutrophils were perfused over cell monolayers expression E- or P-selectin and the rolling velocities calculated. The selectins are a family of molecules on which neutrophils will roll but not firmly adhere . Table 2 shows that significant differences in rolling velocities of neutrophils were seen on E- versus P-selectin coated surfaces in agreement with previous observations. However, statistically significant differences in the rolling velocities on cellular surfaces with E- or P-selectin were not observed regardless of flow chamber design. *Rolling velocities determined as described in Material and Methods on CHO cells expressing human E- or P-selectin. S.D. is indicated in parenthesis. Although the recirculation design may suggest that the neutrophils pass over the cell monolayer several times, the volumes and perfusion rates suggest otherwise. For instance, the recirculating design has a dead volume of 850 μl. In a 10 min experiment at 1.5 dynes/cm2, fluid is perfused at 75 μl/min for a total of 750 μl or only 88% of the volume, suggesting that the flowing neutrophils do not pass over the monolayers more than once. Finally, although gap height of the chamber may also be varied to reduce the volumes, we employed the narrowest gasket currently available for the Glycotech chamber (127 μm). We have shown that alterations in the configuration of flow chambers can dramatically reduce reagent and cellular requirements. These modifications do not adversely effect quantification. In the past, it has not been feasible to study cell populations that were represented at less than 2% of peripheral blood leukocytes such as basophils, eosinophils, or some lymphocyte subsets. For instance, 100 ml of blood yields only ~6 × 105 basophils . This number of basophils was not sufficient for studies in the classic chamber. With these modifications in this report, 4 experiments can be performed Reductions in reagent requirements proportional to those of cellular needs also occur in with the modifications employed in this report, since the modifications primarily decrease volume requirements. We have also configured an injection port in the single pass GlycoTech chamber configuration, allowing for observation of the rapid effects of use of soluble factors. Thus, small molecules such as chemokines, peptides or non-peptide organic compounds that previously would be prohibitively expensive to study can now be studied. For instance, 10 mg of a decapeptide commercially produced for approximately $1000.00 and used at a concentration of 1 mM would require 6.6 mg peptide/experiment at a approximate cost of $660/experiment while the recirculating chamber with 0.02" ID tubing requires 0.94 mg at cost of $93.50/experiment, making large number of experiments affordable. Human umbilical vein endothelial cell (EC) cultures were purchased (Clontech, Palo Alto, CA) and maintained at 30–80% confluency to ensure high viability. Chinese Hamster Ovary (CHO) cells expressing human E- or P-selectin have been previously described [6, 13]. Cells were incubated at 37°C in an air/5% CO2 atmosphere. Neutrophils were isolated as previously described in detail from peripheral blood isolated by venipuncture from normal donors [6, 13]. Two flow chambers with parallel plate geometry were used (Fig. 1A and 1B). 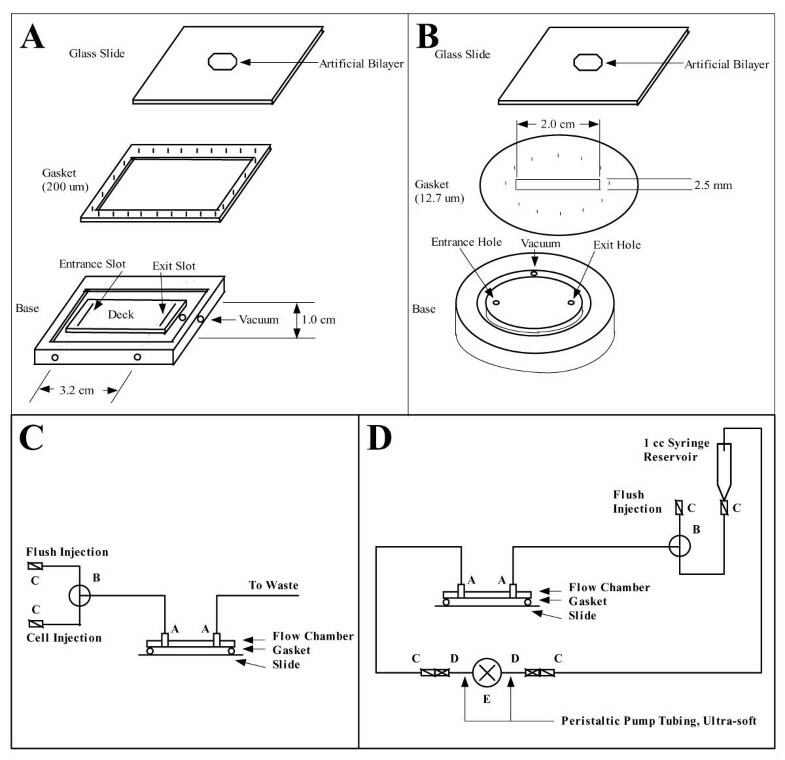 Both flow chambers consist of: (1) base plate with an entrance and exit port through which cells and media are perfused, (2) a glass or plastic slide plate on which the substrate or cellular monolayer is placed, (3) a gasket that controls the chamber diameter, and (4) a vaccum outlet so that the apparatus can be held in place. The sizes of these chambers and their components are summarized in Fig. 1. The first parallel plate had the identical dimensions as described by Lawrence et al  and was kindly provided by Dr. Lawrence (University of Virginia). The second chamber was purchased from GlycoTech (Product number 31–001, Rockville, MD). The GlycoTech chamber was tested in two different configurations, single-pass configuration and a re-circulating configuration. A syringe pump (Harvard Apparatus, Model 22, Cambridge, MA) was employed in the single pass configuration and a peristaltic pump (Harvard Apparatus, Model 66) was used in the recirculating configuration. Internal tubing diameter is indicated in the text. The components of each configuration were set up to minimize tubing, and the volume requirements determined empirically by measuring the volume needed to fill the apparatus. A chamber was placed on the stage of an inverted microscope (Olympus, NY). A CCD camera (Vicon VC240, Albuquerque, NM) enabled recording of all events in the video field by a Toshiba KV-7168A recorder (ADI, Albuquerque, NM). The recorded images were analyzed using NIH Image 1.61 software (available via download at http://http:rsb.info.nih.gov/nih-image). Cellular events in the parallel plate flow chamber were enumerated as previously described [6, 16]. Briefly, Neutrophils are perfused over EC or CHO cell monolayers at defined shear forces as indicated in text in the parallel plate flow chamber. EC are treated with media alone or media containing a potent activator, lipopolysaccharide (LPS) at 5 μg/ml for 4 h, washed, and placed in a parallel plate flow chamber. The entire period of leukocyte perfusion was videotaped under phase-contrast microscopy. All experiments were recorded with a CCD video camera and recorder. Videotaped data frames were digitized for data analysis. Four quantities were measured in the analysis: the total number of accumulated cells, the number of rolling cells, the number of firmly arrested cells, and the rolling velocity. The total number of accumulated cells was determined from videotape at each min for 10 min by analysis of 8–10 random fields (20X phase-contrast objective). Leukocytes were considered firmly adherent after 15 s of stable contact with the monolayer. Rolling cells were easily visualized since they traveled more slowly than free-flowing cells. Rolling velocities were measured for all cells in two to five fields of view for each experiment. Results are presented as averages. Images were recorded on a time-lapse videocassette recorder at real time and played back at 9-fold slower speed. The tape was paused to mark the location of cells, and the distance that the center of individual cells moved was measured 2 to 4 s later. This work was supported by grants from the American Heart Association 9960318Z and American Cancer Society RPG-00-096-01 LBC. Dr Larson is supported in part as the Designated Investigator for the ACS Hoops against Lymphoma in memory Fred Hartman.